leaving their thoughts and dreams invisibly etched? 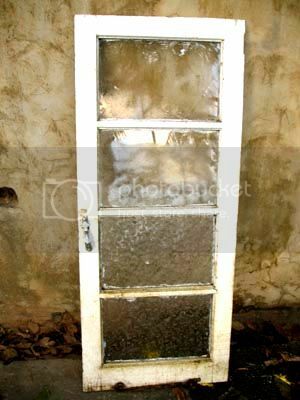 The other day I was walking to the market and I saw a young man in a yard cleaning one of these old windows that I used to collect to make window lamps. (You'll find a few examples of completed window lamps on page 2 of this Gallery Collection). I have been looking for one of these windows for a while now, since my friend Gabrielle comissioned one for her and her boyfriend. I went to the young man and asked him where he'd got the window. He said a man had given him three windows for $10 each and that he was coming back tomorrow to bring more. It looked as though he was fixing up their little home, which is a wooden shack-like structure set back from the Eastern Main Road. The scrubbed windows looked clean and new in comparison to the stained plywood of the shack walls. Anyway, to cut a long story short, he told me he would get a window for me. When I went back yesterday afternoon, he emerged from the little shack next door to the one (on the same compound) where he lives with his child and the child's mother. She (Melissa)refers to him as her "Baby fadda", so I guess she is "Baby mudda." And the little baby might be "Baby Bhudda"?) When Baby Fadda saw me, his face lit up and he said "Lemme go get it." He came back with the window and, when I reached into my pocket to pay him for it, he looked almost offended, shook his head and made a motion with his hands as though giving me a gift. I wonder what this window lamp will turn out to be. People can be so kind. Especially poorer (hate that word and less fortunate sounds so friggin pretentious)people. Either way i'm sure that window will turn into something amazing under your hands. btw...i lost my mouthful of water when you wrote baby bhudda HA! I hate the word "poorer" too because it is based purely on material possessions - and in my experience I have found that some "poorer less fortunate people" are often "rich" in another way - able to give more freely of their simple possessions and of themselves. This window standing on its own is already a masterpiece of human kindness. love the bit about the poor widow. Its so true. I agree elspeth about poorer and less fortunate being based on material possessions - thats what i meant when i said i hated those terms. I know so many people with less of a budget who are so giving! Life's too short not to give..
what about if the man just felt a special bond with you elspeth.sometimes people connect with you like that..if it was someone else he might have acted differently...we all do that..
What's the link....what's the bond that drew you two near.? maybe he was blown away by how interested in the window you were maybe it was just how warm and friendly you were to him...what ever the reason. why does it have to be based on "poor people are more kind." i feel there was a connection. Anonymous, I agree with your opinion. I think that Elspeth, because of the way she approaches people with sensitivity and respect, made a connection and this kindred soul wanted to be a part of whatever she was going to produce. Giving her the window was his contribution to what he believed was going to be something wonderful. Whether his reward was in the good vibes exchanged or the satisfaction from knowing that he had made a contribution to something beyond both of them, I don’t know. Maybe they moved as “one” because they really recognized and respected each other. Recapping on Anonymous "why does it have to be based on "poor people are more kind." I think this is a general view of most people. I have often heard that rich people are rich because they are misers and stingy. True or not I really don't know but this saying is so common ( where there is smoke there is fire). There is this car attendent working in a Stuttgart car park being interviewed on TV docu. He said that most of tips he gets are from people with modest cars. The ones with Mercedes, Porches or the likes hardly tip and when they do it is usually 'peanuts'. 'mind you, 'peanuts' are also good but we are talking about something else here.